Summer to winter, the seasons turn. In the springtime of a distant future, the Doctor and Nyssa become embroiled in Time Lord politics on an alien world. During the stifling heat of a summer past they suffer the vengeful wrath of Isaac Newton. In the recent past, Nyssa spends a romantic golden autumn in an English village while the Doctor plays cricket. And finally, many years after their travels together have ended, the two friends meet again in the strangest of circumstances. 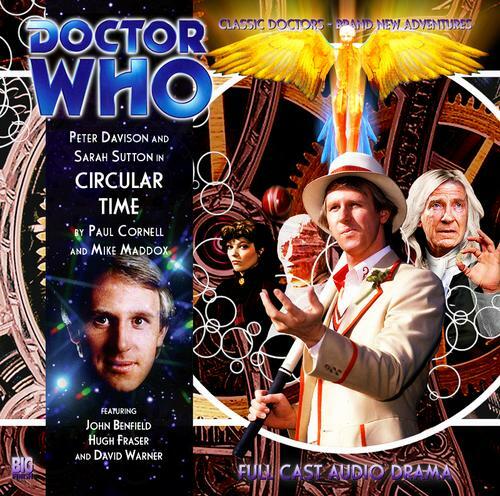 Circular Time is something a little bit different from Big Finish – four stories, all featuring the Fifth Doctor and Nyssa, looking at the concept of “time” from different points of view. Without sharing any sort of continuity, four stories does mean that they run the risk of being rushed and not given a chance to breathe. Each vignette manages to have its standout moments, be it a thought-provoking storyline or a series of great performances from guest star David Warner and main player Sarah Sutton. Spring is a half-hour story that could have been fleshed out into an hour long two-parter.. The Doctor and his companion arrive somewhere, get involved heavily with the locals, while a villain waits in the wings, gloating. Hugh Fraser’s Cardinal Zero isn’t a villain in the full sense of the word, but he definitely has his plans for the Doctor. Spring definitely lays out the story in a very predictable manner, hitting the listener over the head at times and causing me to blurt out in the car “oh, Doctor, don’t be such a bloody IDIOT” at one point as he plays right into Zero’s hands. Fraser is full-on Time Lord; brash, cocky, arrogant, polite when he wants, ruthless when he needs to be, and absolutely believing only he knows what’s best for the avian people. Zero is also a master of regeneration (the Doctor has a line earlier about “different genders, different bodies, different…species. Don’t ask” would send Tumblr into a FREAKING tail spin if any of them heard this story) which ties very heavily into the story’s climax. Bouncing off of the concept of regeneration, Spring talks about how time can transform something frozen into something beautiful. In order for avian society to push past an ingrained legacy of barbaric justice, something that’s a “tradition” and “something they’ve always done,” Cardinal Zero much bring forth a radical change to become the Prophet of avian legend. In this case, time’s effect is one that’s ingrained deep in the avian culture, and it takes a major event to cause the avian to break the chains of tradition and let society bloom into something new and wonderful. Five’s presence in this story is simply to be a “Doctor ex machina” and Nyssa mainly provides commentary on both the society’s flaws and the Doctor’s efforts. The actual plot by Zero is a bit thin and relies on “I knew you were going to do that,” but everything does come together nicely in the end. Davison and Sutton have the same chemistry they always have (“Nyssa?” “Run?” “You know me so well. RUN!”), which helps Spring serve as a decent opening story for Circular Time. Summer is the most straight-forward story in this anthology. The Doctor and Nyssa are locked in the Tower of London and must find a way to convince Isaac Newton to let them go. Sir Isaac Newton is played by David Warner, and for his performance alone Circular Time is worth picking up. An incredibly versatile character actor, Warner’s been in horror flicks (Toe Omen, Waxwork, thrillers (Time After Time), done tons of voice work, and performed with the Royal Shakespeare Company. He’s also an Emmy winner for his work in the miniseries Masada. Doctor Who fans known him as the Ultravox-loving Soviet scientist in the Eleventh Doctor episode Cold War as well playing an alternate universe Doctor in two Unbound stories by Big Finish. But mainly everyone should know him for just being an incredibly awesome guy. Isaac Newton, to put it simply, is of the most brilliant men who ever lived; a scientist, philosopher, astronomer, biologist, physicist, mathematician, member of a heretical Christian sect, and an English patriot through and through. Warner nails nearly every aspect of Newton’s personality in just under half-an-hour, touching not only upon his many academic pursuits, but also his patriotism for England and his massive ago. 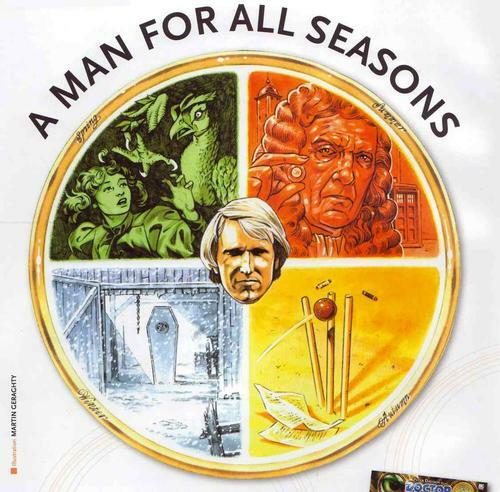 The story’s resolution focuses more on Newton than anything the Doctor and Nyssa do, although once again Davison and Sutton play off each other wonderfully as two very smart individuals try to get into the mind of someone who just might be smarter than either of them while quietly blaming each other for the mess they’re in. But Summer is all about Warner as Newton. The climax of the story comes about when Newton takes the various coins (an Irish coin from 2003, a 1953 pence from the United Kingdom, an American quarter minted in 1974, a Roman piece, and a triangular piece of currency from an alien race) and uses them to conclude that the British Empire will fall, an alien race will invade Earth in the 22nd century (a direct reference to the First Doctor classic The Dalek Invasion of Earth! ), and his name will be all but forgotten. It’s a brilliant little piece of acting from Warner that engages the listener by making them realizes Newton was indeed that brilliant. The scene sums up the story’s central theme that time, especially, is all in how you read it. The past is concrete, written in stone, and can never be changed. All we can do with the past is look at it and use that information to help define our future. The Doctor’s indulgence in cricket tells a very simple story, but one that’s central to the entire nature of the Doctor; not all who wander are lost. The Doctor is never meant to settle down and is never meant to find a place to call home other than his TARDIS. That’s the Time Lord he’s meant to be, going where he needs to go (or where the TARDIS takes him) to help people before quietly leaving for his next adventure. Davison portrays the Doctor in this story as someone who knows he will be leaving soon (as soon as the final game of the season is over) and does his best not to make any long-term attachments with a hint of acceptance and weariness in all his actions during this story. But Autumn is a story all about Nyssa. Sarah Sutton does an absolutly wonderful job as Nyssa tries to put pen to paper as therapy. Her home planet is destroyed, the Master has taken her father’s face to use as his own, and everyone she’s ever known is lost. But all she ever knew before the Doctor arrived was peace, prosperity, and progress. She finds it hard to write any type of story because she truly has no reference of conflict outside of her time with the Doctor. The attentions of Andrew, played by Jamie Sanford, are something that Nyssa has never experienced before either. It’s a half-hour story, so listeners understand what will probably happen between the two young lovers (yes Circular Time is the “did Nyssa just get laid” story, but it’s all done off-screen and INCREDIBLY tastefully). But the journey there, with Nyssa slowly opening up to Andrew and Andrew slowly realizing that Nyssa is from another world, is so well done over a short period of time, especially the ending where Nyssa leaves Andrew to continue traveling with the Doctor. She’s not ready to settle down, but she’s changed during her time in Stockbridge, while the Doctor is simply ready to go wandering about through the universe once again. Autumn is when summer dies, but acorns fall, animals prepare to hibernate, and all things prepare, after winter, to change. Time, as Autumn shows us, changes all things. Nyssa has left behind her feelings about the death of Traken and is ready to move on, but to move on to more death and destruction from traveling with the Doctor. But on the other side, when she finally does decide to leave the Doctor, comes hope and rebirth, after making it through the fall and surviving the winter. Winter sees Peter Davison as a man slowly accepting his fate. He doesn’t want to accept it, but he knows there’s really no other choice. There’s no sense of “I don’t want to go” or “You were fantastic. And you know what? So was I.” Maybe it’s just 1980’s television vs. 2000’s television, but Davison just gives off a “this has to be done, and it’s going to get done, I’m just not going to be smiling and grinning the entire way.” The weariness that always seemed to hang around Five comes full circle. His time has ended, and the time of the Sixth Doctor has begun. Time brings forth both endings and beginnings, as such. Paul Cornell, writer of Human Nature/Family of Blood, has a hand in all four stories, with Mike Maddox penning Spring/Summer based on ideas from Cornell and Cornell composing Autumn/Winter on his own. The directing from John Ainsworth is solid, the sound work from David Darlington is up to the usual Big Finish standard, and where Maddox’s gives us two solid adventures that could make up hour long serials all on their own, Cornell’s episodes take a different look at the Doctor, forgoing the grand alien experience for something more personal on both the part of the companion and the Time Lord. In that regard, Circular Time deserves praise for breaking from the norm and giving Big Finish’s listeners something a little different. It’s nice to know that amidst saving planets and fighting evil, there’s time in the Doctor’s lives for those quiet moments. They might not make for the most exciting stories, but every one and then it’s nice to just sit back and enjoying things by taking a little time. + Sorry, I’ll type that again. DAVID WARNER! 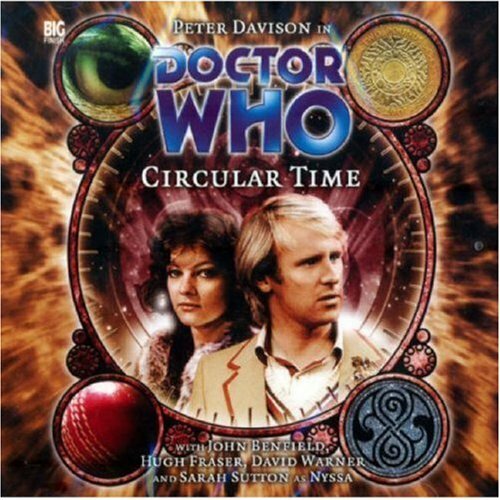 Synopsis – Circular Time gives us some different looks at how time affects the Doctor and Nyssa with all four stories providing a solid level of entertainment, from David Warner’s incredible performance to a closer look at Nyssa’s grief over Traken and wrapping up with a unique take on what might have been going through the Fifth Doctor’s mind during his last moments. Sylvester McCoy is the Doctor in…Nocturne. This entry was posted in Big Finish Review and tagged Big Finish, Big Finish Audio, Big Finish Review, David Warner, Doctor Who, Doctor Who Audio, Doctor Who Review, Fifth Doctor, Nyssa, Peter Davison, Sarah Sutton, TARDIS. Bookmark the permalink.